What surgeons need to know when a patient presents with a proximal humerus fracture that can be managed with open reduction internal fixation. When performing open reduction internal fixation (ORIF) of a proximal humerus fracture, we prefer to place the patient in the lazy beach chair position, with the head of the table elevated to around 30°. Raising the head of the table any higher would make it more difficult to obtain a Grashey view x-ray. The thorax should be situated as close to the edge of the table as possible to allow free access to and mobilization of the shoulder. The patient’s head should be at the top edge of the table to allow for an easier axillary lateral x-ray. The head should be secured to the table with tape to prevent it from falling off the table with shoulder manipulation. The fluoroscopy machine should come in from the top of the table after the table has turned 90° so the contralateral side is next to anesthesia (Figure 1). We prefer to use a hydraulic limb positioner to help hold the arm during the procedure. Figure 1. 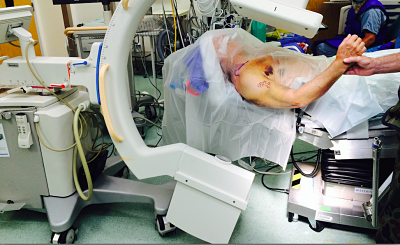 Operating room setup, with the patient in the lazy beach chair position with the head of the table elevated about 30°. It is important to have on hand all surgical instruments that may be needed. This includes K-wires for provisional fixation, several retractor options for improved visualization, curettes, bone hook, Freer elevator, and periosteal elevators of various sizes to help with mobilization of the fragments and fracture reduction (Figure 2). Figure 2. 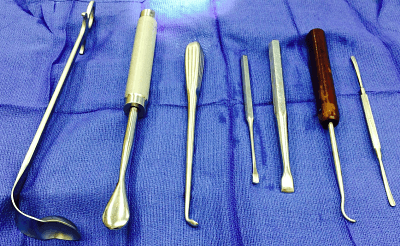 Common additional instruments that are used include, from right to left, the Browne deltoid retractor, Cobb elevator, curved curette, 2 sizes of Key elevators, small bone hook, and a Freer elevator. A Freer elevator or small Key elevator placed across the fracture can assist with head reduction onto the shaft. If needed, a small bone hook is also often helpful for allowing laterally directed force on the medial calcar without soft tissue stripping. Depending on the fracture pattern and bone quality on direct fracture visualization, it may be necessary to forego fracture plate fixation and instead proceed with arthroplasty, especially in the case of 4-part fractures. 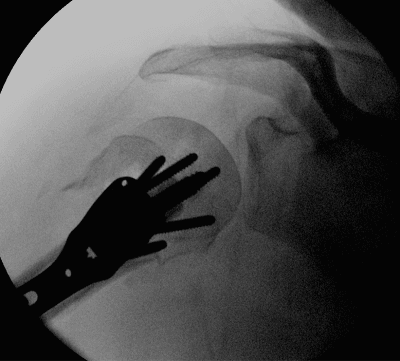 For this reason, it is important to have on hand instrumentation and implants necessary for shoulder arthroplasty. A deltopectoral approach allows adequate view of the anterior structures with limited risk to the axillary nerve, but it limits posterior visualization. This can make reducing fractures of the greater tuberosity difficult, which typically displace superiorly and posteriorly. However, with appropriate exposure of the fracture, the tuberosity can be visualized adequately and reduced appropriately. The deltoid-split approach allows for a more direct view of the posterior and lateral proximal humerus, but visualization is limited by the location of the axillary nerve. The major risk of the deltoid-split approach is iatrogenic injury to the axillary nerve. This can be avoided by identifying the nerve, which is typically located 5 to 7 cm distally from the lateral acromion, traversing the humeral shaft. A posterior humerus retractor, such as a Darrach or Browne deltoid, can be placed behind the humeral head to protect the axillary nerve during the procedure when using the deltopectoral approach (internervous plane). Similar outcomes and complications have been reported when either approach is used appropriately for fracture plate fixation. However, the deltoid-splitting approach is unable to sufficiently expose the anterior proximal humerus to give access to the lesser tuberosity or access to the medial calcar. In more complicated fracture patterns that involve comminution of the medial aspect of the proximal humerus, the deltoid-splitting approach can be more difficult. This approach cannot be extended, while the deltopectoral approach is extensile and allows access to the entire humerus if needed (either intraoperatively or in the future). We prefer the deltopectoral approach for these reasons. Non-absorbable sutures can be placed near the tendon-bone junction of the subscapularis, supraspinatus, and infraspinatus tendons to aid in tuberosity and/or humeral head manipulation. Placing the infraspinatus suture may be difficult through the deltopectoral approach, but it can be accomplished by first placing subscapularis and supraspinatus sutures, and then applying anterior traction/internal rotation to help expose the posterior aspect of the greater tuberosity. Following plate fixation, we recommend securing the sutures to the plate to provide additional stability against cuff rotational forces and to aid in tuberosity fixation. These sutures are sometimes needed to adequately reduce the greater tuberosity even after plate fixation (Figures 3a-3b). Figure 3a. Lateral fluoroscopy view of the proximal humerus with the greater tuberosity gapped. Figure 3b. Lateral fluoroscopy view of the proximal humerus with the greater tuberosity reduced after it was sutured to the plate. Anatomic reduction has been shown to decrease the failure rate of proximal humerus fracture ORIF,  but it can be difficult due to the complexity of these fractures. Once all soft callous/hematoma is removed from around the fracture fragments, manual reduction techniques can be utilized for fracture reduction. Longitudinal traction can be applied to the arm and sustained with a hydraulic limb positioner if needed. Disimpaction of the head and shaft may be achieved with careful use of a periosteal elevator. For varus fractures, the medial calcar should be reduced as adequately as possible to the humeral head. This can be achieved using the cuff sutures and/or inserting a periosteal elevator through the fracture and to the medial aspect of the inferior humeral head fragment (Figure 4). The periosteal elevator can then be used to lever the head back on the calcar. Figure 4. Grashey fluoroscopy view showing a Key elevator placed across the fracture site to help reduce the head onto the shaft. Abduction of the humerus can also help with improving alignment in varus fractures. A small bone hook can be carefully placed over the medial calcar or medial humeral shaft to help with reduction, which allows direct pressure on medial fracture fragments, yet limits medial soft tissue disruption. For valgus-impacted fractures, a periosteal elevator can be inserted across the fracture and used to lever the fracture out of valgus. Alternatively, direct pressure on the superior aspect of the lateral humeral head subchondral bone can be used to reduce the fracture out of valgus. Once the humeral head is reduced more anatomically in a 4-part fracture, the tuberosities should be positioned into the residual defect present from reducing the fracture out of valgus. Another reduction technique that can be utilized is achieving plate reduction to the shaft and then reducing the head and tuberosities to the plate/shaft construct. Following adequate proximal to distal placement of the plate, the shaft can then be reduced to the plate with a compression screw. The head and tuberosity fragments can then be reduced to the shaft/plate construct. Proximal locking screws can be added once reduction is confirmed. K-wires can be used to hold reduced fragments and then act as joysticks to manipulate the fragments. If adequate reduction cannot be obtained by these means, another option is impacting the humeral shaft into the humeral head to gain stability. If this is done, make sure medial support of the humeral head is achieved with screws into the inferior aspect of the humeral head in varus fractures. Multiple studies have shown that a lack of medial cortical support increases the likelihood of plate fixation failure, including screw cut-out and varus collapse. [2-4] In patients with disrupted medial calcar support (medial metaphyseal comminution), it is critical to restore the medial column either through anatomic reduction, in the case of simple fracture patterns, or through slight medial impaction of the shaft to the head. The correct placement of the plate is important for obtaining adequate fixation and appropriate screw trajectory and length. The plate should be aligned along the longitudinal axis of the humeral shaft. It also should be located just lateral (approximately 2 to 4 mm lateral) to the bicipital groove to prevent biceps impingement or compromise of the ascending branch of the anterior humeral circumflex artery. The proximal-to-distal plate placement depends on the design of the plate. Ideally, the plate should be as distal as possible to avoid acromial impingement but in the appropriate position to obtain inferomedial humeral head fixation. Initial shaft screw placement in an oblong hole can allow for some adjustment of the plate if necessary. 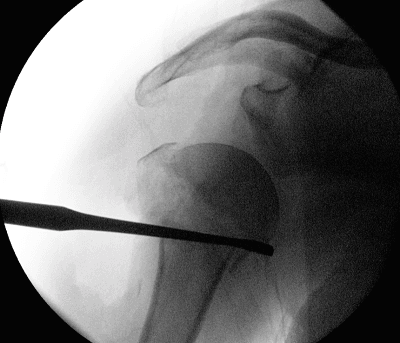 For varus fractures, the trajectory of the inferior screws should be directed into the inferomedial humeral head. Proximal plate sizes generally don’t vary in the same company’s system, yet the size of the proximal humerus does vary from patient to patient. The best bone is located centrally and inferiorly in the humeral head, so the plate should be adjusted to obtain fixation in these aspects of the humeral head. Plate location can also be adjusted based on the greater tuberosity fragment; however, greater tuberosity fracture fixation can always be strengthened with sutures later in the procedure. One group of authors recommends using calcium phosphate cement if the combined cortical thickness of the proximal humeral diaphysis is less than 4 mm and the medial cortex is intact. They recommend fibular strut augmentation when the medial cortex is deficient, regardless of cortical thickness. If a fibular strut is used, it can be manipulated with a K-wire, manual techniques (ie, bone tamp), or the use of push screws through the plate. For varus fractures, the allograft should be placed medially to provide support to the medial column (Figure 5). In valgus fractures, a fibular strut allograft placed more laterally may be used to hold the impacted humeral head out of valgus and support the humeral head in the bone void created from valgus impaction. Figure 5. Grashey fluoroscopy view demonstrating the final construct with a medial fibular strut in a varus 3-part proximal humerus fracture. Calcium phosphate cement can be used to fill the defect in the proximal humerus from either varus or valgus impaction. This decreases the chance of humeral head subsidence and increases construct stiffness, with the calcium phosphate filling the defects around the screws. Screw perforation into the articular surface is a significant cause of reoperation in ORIF proximal humeral fracture plate fixation. This is either primary at the time of fixation or secondary from humeral head subsidence postoperatively. A key to avoiding secondary screw perforation is to refrain from drilling into the subchondral bone, which gives minimal friction against preventing humeral head collapse over the screw. To do this, careful drilling and judicious multiplanar fluoroscopy should be used during drilling, with the drill on reverse. The screw length should be slightly shorter than the depth measured to prevent screw perforation, using a depth gauge and/or fluoroscopy when needed. Before closing the wound, use fluoroscopy to confirm adequate reduction in several planes (using rotation of the humerus). Live fluoroscopy while rotating the humeral head also allows the surgeon to ensure that no screw is penetrating subchondral bone. We recommend changing out screws for shorter screws even if they are close to the subchondral bone, given the chance of humeral head subsidence. We perform live fluoroscopy on the axillary lateral view, which more commonly identifies long screws compared with the AP/Grashey views. Joseph J. King, MD; Corey A. Jones, BS; and Thomas W. Wright, MD, are from the Department of Orthopaedic Surgery, University of Florida, Gainesville, Florida. Buecking B, Mohr J, Bockmann B, Zettl R, & Ruchholtz S. (2014). Deltoid-split or Deltopectoral Approaches for the Treatment of Displaced Proximal Humeral Fractures? Clin Orthop Relat Res. 472(5): 1576-85. Krappinger D, Bizzotto N, Riedmann S, Kammerlander C, Hengg C, & Kralinger F. (2011). Predicting failure after surgical fixation of proximal humerus fractures. Injury. 142(11): 1283-8. Gardner MJ, Weil Y, Barker JU, Kelly BT, Helfet DL, & Lorich DG. (2007). The Importance of Medial Support in Locked Plating of Proximal Humerus Fractures. J Orthopaedic Trauma. 21(3): 185-91. Ponce B, Thompson K, Raghava P, Eberhardt A, Tate J, Volgas D, & Stannard J. (2013). The Role of Medial Comminution and Calcar Restoration in Varus Collapse of Proximal Humeral Fractures Treated with Locking Plates. J Bone Joint Surg Am. 95(16): e113 (1-7). Erhardt JB, Stoffel K, Kampshoff J, Badur N, Yates P, & Kuster MS. (2012). 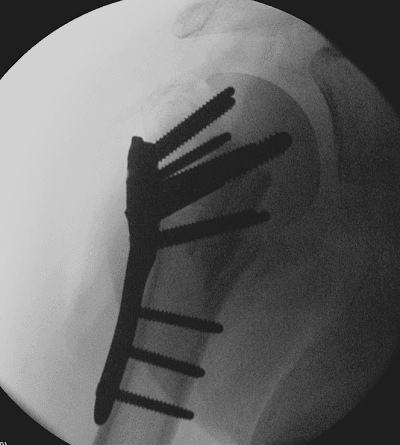 The Position and Number of Screws Influence Screw Perforation of the Humeral Head in Modern Locking Plates. J Orthopaedic Trauma. 26(10): e188-92. Zhang L, Zheng J, Wang W, et al. (2011) The clinical benefit of medial support screws in locking plate fixation of proximal humerus fractures: A randomized controlled study. International Orthopaedics. 35(11): 1655-61. Chow R, Begum F, Beaupre L, Carey J, Adeeb S, & Bouliane M. (2012) Proximal humeral fracture fixation: Locking plate construct ± intramedullary fibular allograft. J Shoulder and Elbow Surgery. 21(7): 894-901. Namdari S, Voleti P, & Mehta S. (2012). Evaluation of the osteoporotic proximal humeral fracture and strategies for structural augmentation during surgical treatment. J Shoulder Elbow Surgery. 21(12): 1787-95. Kennedy J, Molony D, Burke NG, Fitzpatrick D, & Mullett H. (2013) Effect of calcium triphosphate cement on proximal humeral fracture osteosynthesis: a cadaveric biomechanical analysis. J Orthopaedic Surg. 21(2): 173-7. 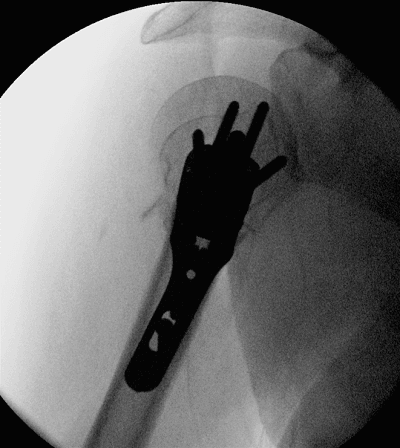 Neviaser A, Hettrich C, Beamer B, Dines J, & Lorich D. (2011) Endosteal Strut Augment Reduces Complications Associated With Proximal Humeral Locking Plates. Clin Orthop Relat Res. 469(12): 3300-6. Egol KA, Sugi MT, Ong CC, et al. (2012) Fracture site augmentation with calcium phosphate cement reduced screw penetration after open reduction internal fixation of proximal humeral fractures. J Shoulder Elbow Surg. 21(6): 741-8. Liew A, Johnson J, Patterson S, King G, & Chess D. (2000). Effect of screw placement on fixation in the humeral head. J Shoulder Elbow Surgery. 9(5): 423-6. Previous articleWho’s a Candidate for Biceps Tenodesis vs. Biceps Tenotomy?